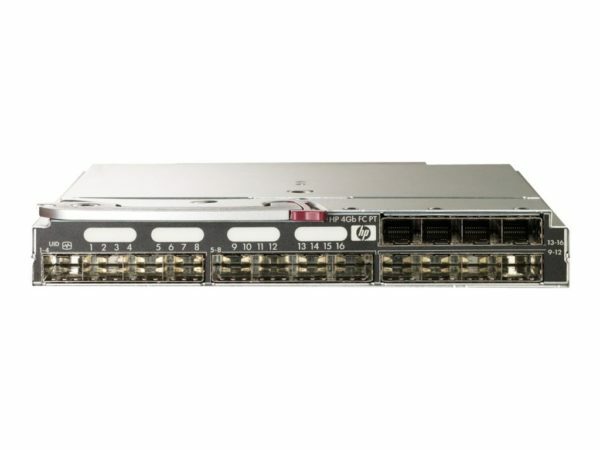 The HPE 4Gb Fibre Channel Pass-Thru Module for HP c-Class BladeSystem is designed for those customers desiring a direct connection between each server blade within the enclosure and external Fibre Channel SAN switches, directors, or SAN controllers.Ideal investment protection for data centres with existing storage networking infrastructure. 4Gb Fibre Channel Pass through expansion module with 16 ports by Hewlett Packard Enterprise delivers direct connection between each server blade within the enclosure and external Fibre Channel SAN switches, directors, or SAN controllers. HPE 4Gb Fibre Channel Pass through expansion module has 300836-B21 Long wave 2 Gb optical transceiver- (35 km) SFP. HPE 4Gb Fibre Channel Pass through expansion module is monitored by the enclosure On board Administrator and allows no need for SAN management inside the enclosure. The 4Gb Fibre Channel Pass-Thru Module is shipped as a single unit and should be ordered in quantities of two. Qty 1, HP 4Gb Fibre Channel Pass-Thru Module – Expansion module – 4Gb Fibre Channel – 16 ports.